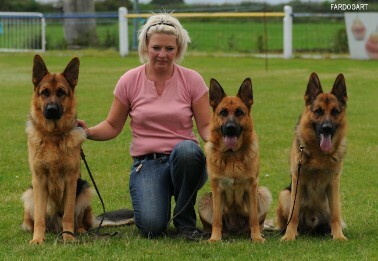 Ang & Malc Walden enjoy owning, working and showing German Shepherd Dogs. Our very first shepherd Chaz was a very noble and special young man. He was a classic stand offish animal that allowed the select few into his pack. The first special one to be 'accepted' was Gyp. Gyp was raised on a Gypsy camp (hence the name) and moved around alot and had quite a few homes. Gyspsy taught us alot about dog behaviour and training. He was Chaz's best friend and our protector. Unfortunately, we lost Gyp at the age of 11 to cancer and after losing his best friend, Chaz left us a year later. Chaz allowed my friends' lovely springer spaniel named Breezey into his pack (well she thought she was a GSD) and also a black lab - Henry - lodged with us for a while. These original noble, intelligent and loyal dogs led us to follow our hearts into German Shepherds. Thanks to Deb and Andy of Arkashan GSD for allowing the AMAZING Arkashan Fanto at Anchaz to come to us but also for finding the fabulous Lindanvale Orlanda at Anchaz who both have given us the 'Anchaz' line of healthy, affectionate and focused GSD's. We couldn't have the show and work success that we do without the support of our family who dog sit for us, but also all our extensive physical and virtual friends. Not only do our dogs bring us years of love and joy but they have bought some wonderful people into our lives.